Amazing Premium LB Aisle seats Section 106, four seats. 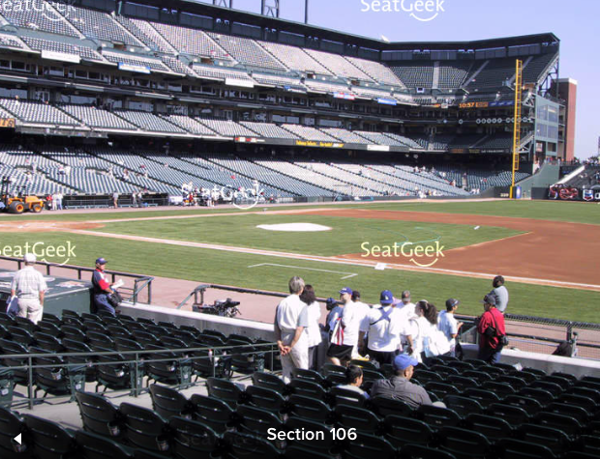 On the 1st Base FIELD CLUB Aisle, Section 106, 18th row - the best Premium Lower box available - only four feet from more expensive FIELD CLUB section. See the photo. Quick access to vendors and entrance/exit gates. Many foul balls and great direct views of batter and 1st Base action. Face value. These are TRULY GREAT seats!!! All games are sold for the season? I'd be interested in 4 seats, 10-15 games for next season and beyond. Thank you. All seats gone for this year. Next year possible. Not sure how to stay in touch but will offer same next season. Are post season tix available? Thanks again. Also, for the minimum game purchase, are you looking for 15 games at 4 seats per game? If I was only looking for two tickets, that would be 30 games total (2 seats per game)? The price listed says $69. Is this the average cost of each seat, or is it just the low end cost. IE - does every member pay the same amount regardless of the specific games they get? Jay: that is the average price per ticket over the whole season. For example, If you were to choose only Saturday and Sunday games, the average price will be more than if you choose Monday and Tuesday night games. All partners choose according to the percentage they own. If you bought 25%, you would choose four tickets every fourth turn. At the end of the draft each partner pays the exact face value of the seats he has chosen. So far everyone has been very happy. Would you be able to choose between 2 or 4 tickets per game? This listing has been saved by 145 people.